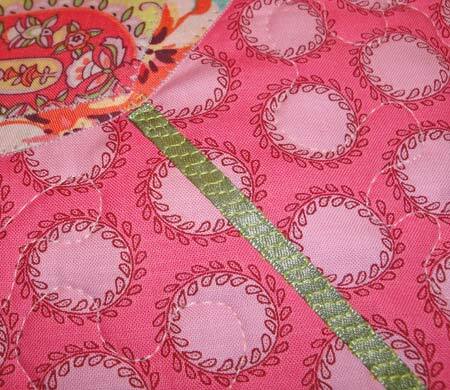 The upside and downside to sewing things is all the leftovers that quickly multiply and overflow. 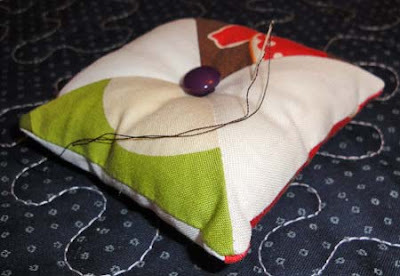 In an "aha" moment, I used two leftover blocks to make one long-overdue and much-needed pin cushion. Total sewing time 5 minutes; total procrastination time 4 years. No more stumbling upon needles in random places. 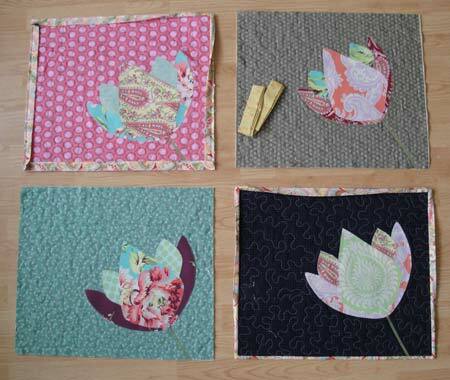 And I used the bits and pieces of flower parts that didn't make the cut into the Fanciful Flowers quilt for four mismatched, but colorful, place mats. Rather than appliquing the flower by hand, I fused the shapes onto the background fabric and blanket stitched all around and finished with all over stippling. The stems were an easy fix, too. I cut double-sided fusible interfacing into thin strips and ironed the ribbon onto the fabric and then used a fancy stitch on my sewing machine to secure the ribbon in place.